Kellogg counts many leading-edge thinkers in its Accounting and Information Management Department. Dept. 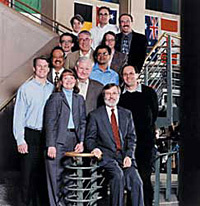 chair Robert Magee (seated) with the AIM faculty. Not pictured: Prof. Allan Drebin. Ronald Dye, the Leonard Spacek Professor of Accounting Information and Management. His work on audit firm incorporation and the issues surrounding audit and consulting conflicts serves as a backdrop for recent developments in the industry. Assistant Professors Mark Finn and Stephen Hillegeist, who examine the relation between the quality of information a firm discloses and the market for its securities. Bala Balachandran, the J.L. Kellogg Distinguished Professor of Accounting Information and Management and Decision Sciences, who is a world authority on cost management strategy. Assistant Professor Elizabeth Keating; Thomas Lys, the Gary A. Rosenberg Professor of Real Estate Management; and department chair Robert Magee, the Keith I. DeLashmutt Distinguished Professor of Accounting Information and Management, who have explored the accounting signals that explain the 60-percent drop in Internet firms' stock prices last spring. Professor Thomas Prince, who is a recognized authority on predicting financial distress in the healthcare industry. Lawrence Revsine, the John and Norma Darling Distinguished Professor of Financial Accounting, who researches how managers' contracting incentives influence financial reporting choices. Associate Professor Beverly Walther, who studies the ways stock prices reflect the information in management announcements and analysts' forecasts. Associate Professors S. Sridharan and Frank Gigler, who have published papers on a variety of corporate disclosure topics. Associate Professor Linda Vincent, who is a prominent thinker on financial and accounting issues in real estate. Professor Allan Drebin, who hopes to put his research on governmental budgeting into practice on the local level when he runs for a seat on the Evanston City Council.